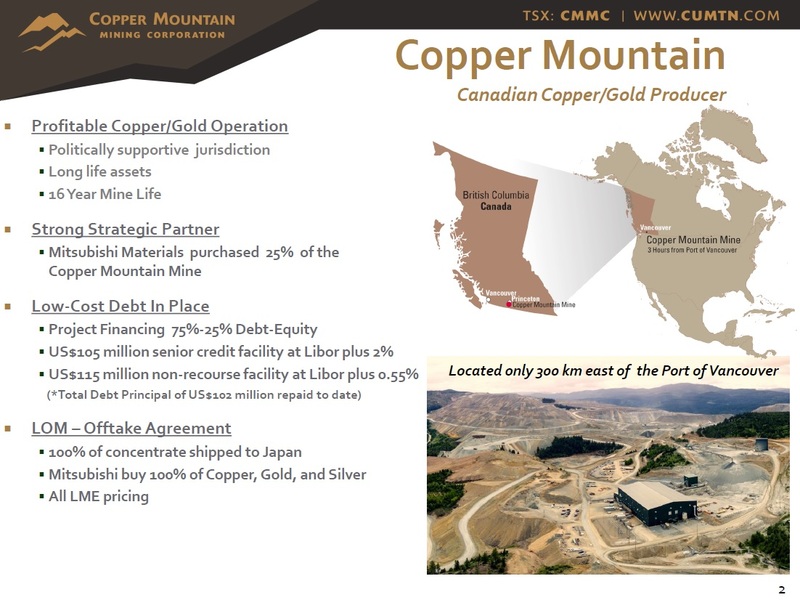 Copper Mountain's flagship asset is the Copper Mountain mine located in southern British Columbia near the town of Princeton. The Company has a strategic alliance with Mitsubishi Materials Corporation who owns 25% of the mine. The Copper Mountain mine has a large resource of copper that remains open laterally and at depth. This significant exploration potential is being explored over the next few years in order to fully appreciate the property's full development potential. Additional information is available on the Company's web page at www.CuMtn.com. Mining activities have been focused on Pit #2, the Saddle Zone and Oriole Pit during 2017. A total of 72.6 million tonnes of material was mined in 2017 (including 26 million tonnes of ore and 46 million tonnes of waste for a strip ratio of 1.76:1). Cash flows from operations before changes in working capital items for 2017 were $102.8-million. Drill hole assays confirmed the high gold tenor of the Ingerbelle mineralization estimated from historical production data to average 0.66 g/t Au for every 1% of copper grade. Drill hole locations were designed so as to intersect the historically defined mineralization in an evenly distributed pattern to the extent that topography, and water or backfilled areas would allow. Historical drill data in the Ingerbelle deposit consisted of 582 drill-holes totalling 80,500m, approximately half of which are below the previously mined area. The 35 significant drill intersections from the current program, as tabulated below, have an average CuEq grade of 0.48% ( 0.34% Cu, 0.70 g/t Ag and 0.22 g/t Au). 17IG-13 was abandoned in overburden. 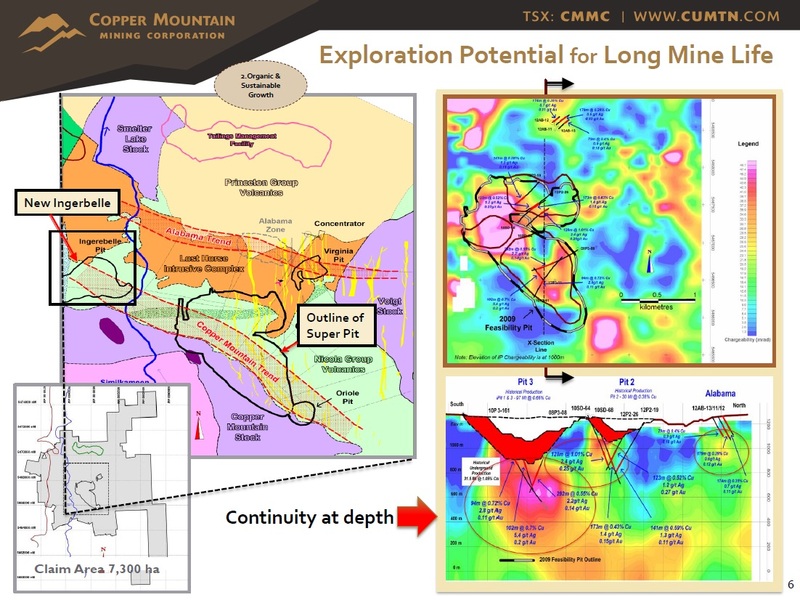 Copper Mountain announced Altona Mining Ltd. Acquisition. Plans to build a mine, doubling copper production in 2020. Huge land package, will add 4,000 sq. km of ground in world class mining region. Mr. Clausen has more than 30 years’ experience in the areas of management, finance, development and operations in the base metals and precious metals industry. Mr. Clausen was the Chief Executive Officer of Brio Gold Inc.
Mr. O'Rourke has more than 40 years of hands–on experience in mine evaluations, development, project financing, marketing and operations in Canada, the United States, South America and the Philippines. In 2013 Mr. O'Rourke was inducted into the Canadian Mining Hall of Fame. Mr. Strickland is a senior executive with proven leadership with a record of success. As general manager and vice-president of the Copper Mountain mine, he has lead the team since April, 2013. Mr. Strickland has over 25 years mine operational experience. Mr. Strickland has gained extensive experience in mineral processing, project development and mine management while working with Placer Dome, Barrick Gold Corp. and Yukon Zinc at operations in Canada and internationally. Mr. Shier has over twenty years experience as a corporate officer and director to a number of publicly–traded mining companies, and has experience in raising over $1 billion in debt and equity financing transactions. In 2013 recipient of the Edgar A. Scholz Medal for Excellence In Mine Development in British Columbia. Mr. Holbek holds a Masters of Science in Economic Geology (1988) and has 30 years experience in mineral exploration and mine development. Mr. Mracek has 40 years of practical and management experience in both underground and surface mines across Canada. With a particular focus on 3D modeling, mineral inventory and deposit estimation and database administration, Mr. Joyes brings a wide variety of both field and computer based skills to the exploration team. Please refer to Copper Mountain Mining Corporation's website www.cumtn.com for complete biographies. On October 31, 2018, Copper Mountain Mining Corp. has released its third quarter 2018 financial results. The Company's financial statements and management discussion and analysis are available on the company's website and SEDAR. 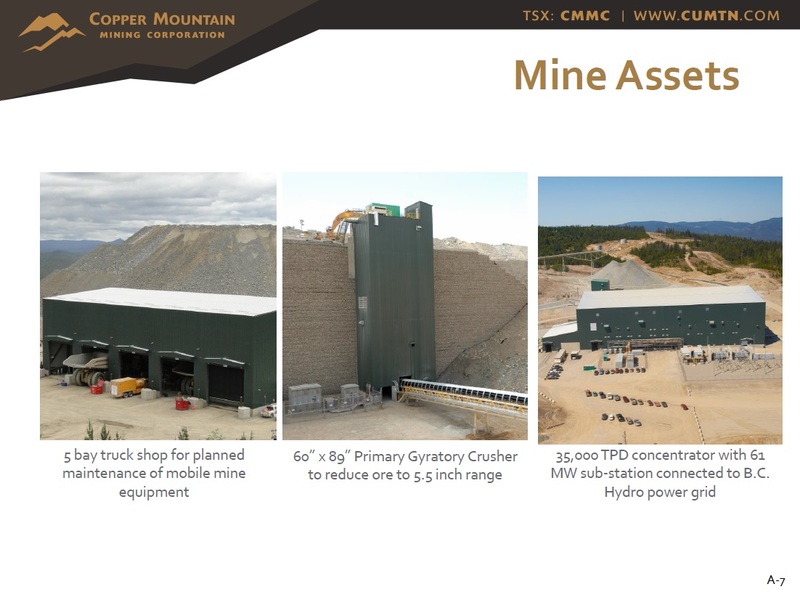 On October 11, 2018, Copper Mountain Mining Corp. has released production results for the third quarter of 2018 for its Copper Mountain mine, located in Southern British Columbia. Production for the third quarter 2018 was 18.3 million pounds of copper, 7,500 ounces of gold and 64,900 ounces of silver, which was in line with expectations. The Company guided that third quarter 2018 copper production would be approximately 10 per cent lower than the second quarter due to lower copper grades being mined. Actual copper production was 8.5 per cent lower than the second quarter. Fourth quarter copper production is expected to be the strongest quarter of 2018. The Company remains on track to achieve 2018 annual production guidance of 80 million pounds of copper (plus/minus 5 per cent). Copper-equivalent production was 22.0 million pounds and was down only 4.8 per cent compared with the second quarter due to higher gold production as a result of increased gold grade and recovery after the installation of a flash flotation circuit in the concentrator. On October 1, 2018, Copper Mountain Mining Corp. has provided positive results from its feasibility study on its 100-per-cent-owned Eva copper project, which is located in Queensland, Australia. On September 27, 2018, Copper Mountain Mining Corp. announced robust Preliminary Economic Assessment results for its New Ingerbelle property. All dollars are in U.S. dollars unless otherwise indicated. On September 21, 2018, Copper Mountain Mining Corp. announced new mineral resource for its New Ingerbelle property. Inferred mineral resource of 69 million tonnes grading 0.27 per cent copper and 0.16 gram per tonne gold (0.38 per cent copper equivalent) for contained metal of 405 million pounds of copper and 360,000 ounces of gold at a 0.16-per-cent cut-off copper grade. On September 19, 2018, Copper Mountain Mining Corp. announced that it has completed phase 2 of its three-phase drilling program at the New Ingerbelle property, and results continue to be positive. Hole 18IG-28 returning 54 metres of 0.58 per cent CuEq (0.42 per cent Cu, 0.80 g/t Ag, 0.23 g/t Au) and 90 metres of 0.62 per cent CuEq (0.46 per cent Cu, 0.57 g/t Ag, 0.23 g/t Au). On August 14, 2018, Copper Mountain Mining Corp. has released additional drill results from phase 2 of its three-phase drilling program at the New Ingerbelle property nearby the present operations of the Copper Mountain mine. Hole 18IG-15 returning 24 metres of 0.77 per cent copper equivalent (0.52 per cent copper, 1.07 gram per tonne silver and 0.36 gram per tonne gold). On August 7, 2018, Copper Mountain Mining Corp. has provided its second quarter 2018 financial results. The Company's financial statements and management discussion and analysis (MD&A) are available at the company's website and at SEDAR. On July 16, 2018, Copper Mountain Corp. announced that the Company has appointed Letitia Wong as vice-president, corporate development and investor relations, and has appointed Lance Newman as vice-president, project development. 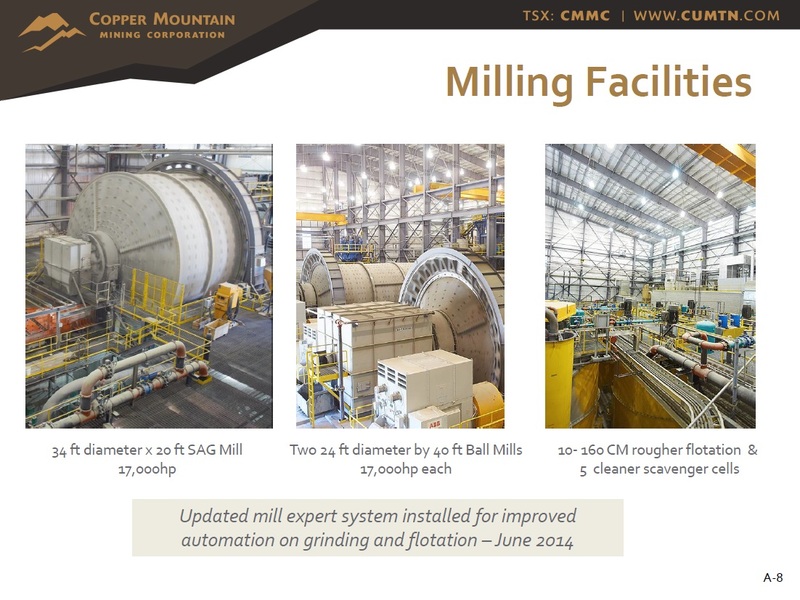 On July 12, 2018, Copper Mountain Mining Corporation announced production results for Q2 2018 from the Copper Mountain Mine, located in southern British Columbia. Q2 Production: 23.1 million pounds of copper equivalent, which includes 20 million pounds of copper, 6,500 ounces of gold and 68,400 ounces of silver. On June 7, 2018, Copper Mountain Mining Corp. announced that it has commenced drilling at the New Ingerbelle deposit at the Copper Mountain mine, located in Southern British Columbia. This phase 2, 10,000-metre drill program has been designed to follow up on the successful phase 1, 2017 drilling program. On June 6, 2018, Copper Mountain Mining Corp. announced that it has confirmed that it will be holding its annual and special meeting of shareholders on Wednesday, June 20, 2018, at 2 p.m. PT. The meeting will be held at the Terminal City Club, 837 West Hastings St., Vancouver, B.C. On May 24, 2018, Copper Mountain Mining Corp. has approved a $5-million budget for its Cloncurry project located in Queensland, Australia. Planned work programs will include follow-up drilling on discoveries made in 2017, testing of new targets and supporting works for the active full feasibility study on the proposed Eva copper mine, which is compliant with National Instrument 43-101. On April 27, 2018, Copper Mountain Mining Corp.'s president and chief executive officer, James C. O'Rourke, will be retiring on June 1, 2018. Gil Clausen, currently president and CEO and director of Brio Gold Inc., will succeed Mr. O'Rourke as president and chief executive officer and will also join the company's board of directors. Mr. Clausen will complete his current obligations, including the closing of the acquisition of Brio Gold Inc., prior to joining Copper Mountain. Mr. O'Rourke will remain as non-executive chairman and director of the company. On April 27, 2018, Copper Mountain Mining Corp. had 2018 first quarter revenues of $78-million after pricing adjustments and treatment charges from the sale of 24.8 million pounds of copper equivalent, including 21.7 million pounds of copper, 6,500 ounces of gold and 80,600 ounces of silver. Total cash cost for the quarter ended March 31, 2018, was $1.90 (U.S.) per pound of copper sold, net of precious metals credits. 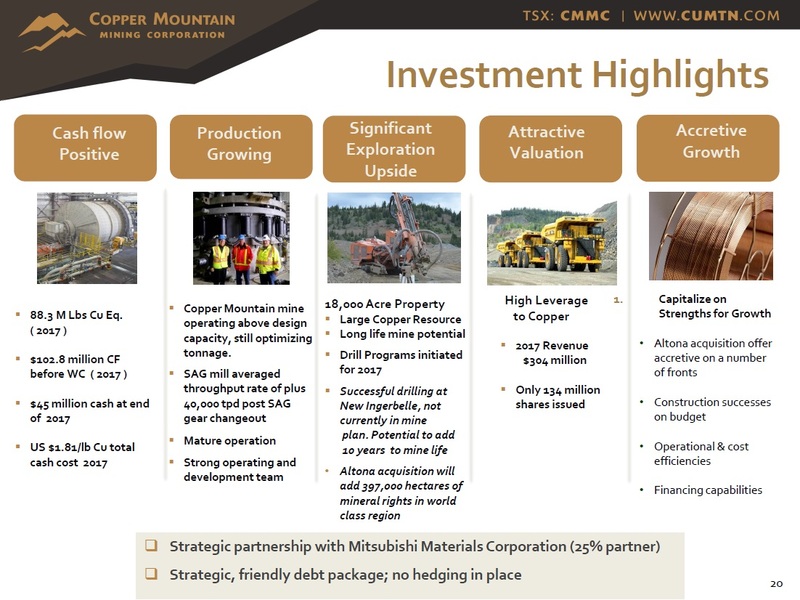 On April 18, 2018, Copper Mountain Mining Corp. has completed its acquisition of Altona Mining Ltd. As part of the acquisition, the company issued 0.0974 of a Copper Mountain share for each Altona ordinary share, resulting in a total of 53,538,984 Copper Mountain common shares being issued, of which 44,368,605 will trade as CHESS Depository Instruments (CDIs) on the Australian Stock Exchange under the symbol C6C. 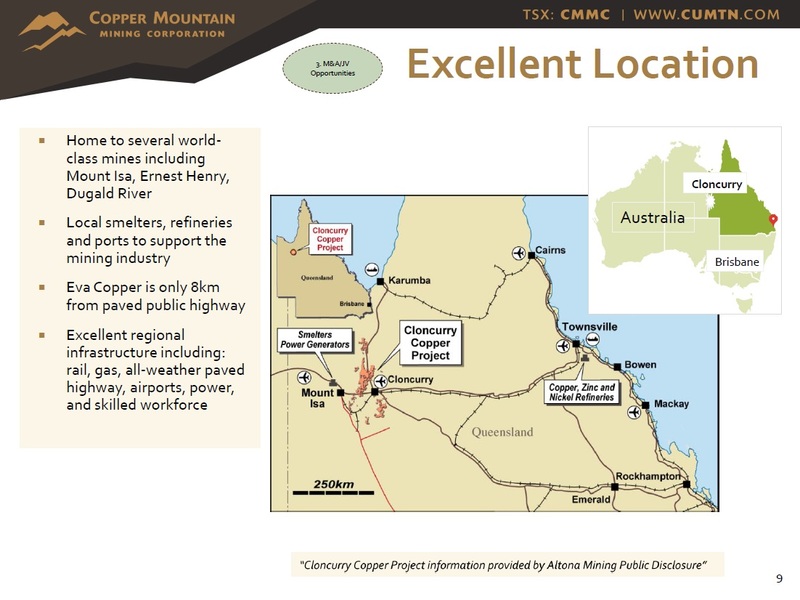 As a result of the acquisition, the company has now added 100 per cent of Altona's assets to Copper Mountain, which include $30-million in cash, a permitted development project in Queensland, Australia, and a large mineral land tenure position in a highly prospective area in Queensland, Australia, a mining friendly jurisdiction. On April 3, 2018, Copper Mountain Corp. announced that the Federal Court of Australia has made orders approving the scheme of arrangement between Altona Mining Ltd. and its shareholders under which Copper Mountain Mining Corp. will acquire all of the shares in Altona. The Company also announced that it has received approval, subject to the usual conditions, from the Australian Securities Exchange for the admission of Copper Mountain to the official list and to the official quotation of Copper Mountain's CHESS Depository Instruments (CDIs). It is anticipated that trading in Altona's shares on the ASX will be suspended from close of trading on April 4, 2018, and that trading in Copper Mountain CDIs (which have been assigned a stock code of C6C) is expected to commence on a deferred settlement basis on April 5, 2018. It is anticipated that the scheme will be implemented on April 18, 2018, at which time Copper Mountain CDIs will commence trading on the ASX. On March 26, 2018, Copper Mountain Mining Corp. announced that Copper Mountain Mining Corp. and Altona Mining Ltd. shareholders have respectively voted in favour of the share issuance resolution and the scheme of arrangement, providing for the acquisition of Altona by Copper Mountain, at their special meetings of shareholders. On March 13, 2018, Institutional Shareholder Services Inc. (ISS) and Glass, Lewis & Co., two leading independent proxy advisory firms, have recommended that Copper Mountain Mining Corp. shareholders vote for the plan of arrangement, whereby Copper Mountain will acquire all of the issued and outstanding common shares of Altona Mining Ltd., at a special meeting of shareholders to be held on March 26, 2018, at 2 p.m. Pacific Time, at the Terminal City Club (Ceperley-Walker Room), located at 837 West Hastings Street in Vancouver, B.C. On March 12, 2018, Copper Mountain Mining Corp. announced that is to be featured on CEO Clips on CBC’s Documentary Channel, March 12 – 25, 2018 Monday-Friday between the hours of 6:00am and 12:00am. This CEO Clip, featuring Jim O’Rourke, Copper Mountain CEO, can also be found on Copper Mountain’s website (www.cumtn.com). On February 20, 2018, Copper Mountain Mining Corporation announced that it had 2017 year-end revenues of $304-million, after pricing adjustments and treatment charges, from the sale of 73.9 million pounds of copper, 23,800 ounces of gold and 264,800 ounces of silver. Total cash cost for the year was US$1.81 per pound of copper sold, net of precious metals credits. The mine had $102.8-million in cash flow from operations and generated $67-million in earnings.